The Ultimate Guide to Productivity - what's your secret? After a - in my eyes - very productive week for us I come back to the blogosphere to find that Adam - Monk at Work - Kayce tagged me (and Dawud, Dave, Char and ChrisG) with Ben Yoskovitz Group Writing Project Meme to write The Ultimate Guide to Productivity. Productivity = producing something, anything in fact. Not copying (IMHO), so rule 2 comes in handy: in order to produce your best tip on productivity you have to 'study' others who have taken up the gauntlet of this project already (best tips found during this search are at the bottom of this post). My best tip? I've been pondering about this question since I found out about this project. Sticking to your hedgehog-concept came to mind (keep doing what you do best), getting organised also and planning your activities around your personal 'work-best-at-specific-times-of-the-day notion. And a recent post by Kent Blumberg on Focus is a great tip on its own too. We all know these kind of productivity tips and we all try to keep true to them. I'm at my best when I am having fun, when I enjoy what I'm doing. I try to have fun every day (and I work 7 days a week), every hour of the day. I've also learnt to try to make fun of most menial tasks every business/job brings with it. Find the right tools for the job, any job. Think handy software programs, proper equipment, the right procedures and systems. Nothing is more frustrating than knowing what to do but you're grinding to a halt because you lack the proper tools. Get the right advice or know who can help you tackle a task or plan. Ignorance isn't bliss. Knowledge is. And advice is all around, it can come in the form of books, blogs or pleasant, rewarding and very enjoyable monthly lunch-meetings with my mentor (and we both have fun: teaching - learning - understanding). All you have to do is ask, then know what you like and like what you know. Have clarity in character (thanks Adam, you have found me the perfect word for this - clarity): don't do things that go against the grain of your character, it will only frustrate you in the end. And frustrations aren't fun. Not just clarity in your own character, but also your partner's or team members. Small example: last week after the exhibition my partner Ton mentioned the difference between him and me reacting to people stopping and looking at our displayed samples of wooden flooring. He would stay back until he felt this person required more details or info, while I 'jumped' everyone who stopped and looked. "Not everyone is really interested," he says. "No, but everyone might be interesting," I say. Asking me to hold back goes against my grain (extrovert), asking him to 'jump' everyone goes against his grain (more introvert). We wouldn't have fun, now we did. So my best tip has to be: make sure the work/task/profession you have is that what you like doing best, what you enjoy most, what brings you the most fun. I'm very interest to hear from Mark, Jeff and Stuart about their best tips on productivity. We survived it: three months of preparations and last-minute panics all seem to have paid off. (Didn't forget one thing, how about that! If anything we came over-prepared, you can blame me for that). On Wednesday afternoon we emptied over half our showroom, loaded the van and set off to Detling (20 minutes drive). The organisation for the build-up day was excellent, every exhibitor had an arrival slot and handy little hand transport cars - including 'driver' - were plenty available. 10 minutes after arriving on site all our materials were inside and 20 minutes later we had everything set up. Thursday morning our 'assistant' of the day (one of our main suppliers) arrived 10 minutes before us and displayed our new range to complete our stand. (Let me tell you: a 6 meter wide stand isn't really that wide after all once everything is displayed, but we managed anyway.) 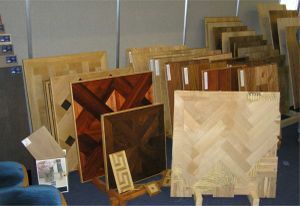 All in all we had 45 different types of natural wooden flooring on show. The Kent 2020 vision exhibition is getting bigger and bigger every year and is always well organised: key-note speakers, interesting workshops and a huge array of businesses in the Exhibition marques (over 300 stands, companies ranging from IT, marketing, printers to holidays, insurance and construction), ensuring that over 4,000 business people from all over Kent have a lot to do, to see, to network and to market their own business. From 8am on the three of us (Geoff, our 'assistant', Ton - my partner in crime - and I) were handing out our new booklet, explaining the various ranges, collecting business cards, writing down specific details of those wanting extra specific information (we can send that by email sir/madam, it will be in your inbox tomorrow afternoon at the latest). We met Architects, Developers, Designers, companies looking for new floor-covering for their commercial premises and lots of business persons asking if we also did domestic projects (talk about win-win-win situation for us). And we had fun! Who wouldn't if you receive compliments on your wide range of flooring, about your booklet and on the way you take time to explain various expects of installation methods. Friday I counted 33 definite leads - ranging from architects to commercial projects and many domestic enquiries. This morning 33 follow-up letters (including our Kent2020 special offer) went to the post-office. I hadn't realised that the follow-up work would take up so much of my time, learned something new again. The best thing of the whole experience is that we met a lot of interesting people, that we can look back (even with some pride) to a very, very busy day and that - at the moment - all three of us feel it has been a successful first large B-2-B Exhibition for Wood You Like. Since most other preparations for the big Exhibition are almost complete (still can't shake that feeling I'm forgetting something important!) I thought I would use some 'left-over' time to talk about the software programs I used (use, will use) to help me with marketing this event. Our aim for exhibiting on Kent's largest business-2-business exhibition this year (our first time) is to (re)establish more and better contacts with the many Architects, Interior Designers, Property Developers and Self-builders (our ADDS-group). We are filling a 6 by 2 meter stand on Wednesday afternoon with many our large sample boards to show off our 5 main ranges of natural wooden flooring to give this group the best possible (first) impression of what we can supply (and install) on Thursday. Filling a stand is one thing, attracting many visitors to it is another. Through a telemarketing project 3 years ago we already had a list of 90 possible contacts in our newsletter database, and some 'random' collected business cards of others. Since end November last year I'm using Mamut's 'Sales and CRM software package' (daily used for keeping track of all 'conversations' - quotes, order confirmations, job-details, maintenance services, delivery and installation dates and even emails sent - with our customers). My growing experience with the program and with some help from my friend Lesley (Ashford Computer Training - ACT) it was simply a matter of filling a new database with contact details of our ADDS-group. Mamut allows you to create numerous different databases in the package (very different than the 'cheapskates' of Sage). The best part of using Mamut for this is the document template facility, combined with group 'tags' you can attached to every contact. And the facility to add more contacts under the same company name. In Word I had written our invitation to our ADDS-group, turned it into a template and presto, with one (no make that three) clicks 125 invites were mail-merged, plus 'registered' as printed on all separate contacts. Creating an envelop per contact was easy in the same way. We added a little piece of wood to the letter and envelop to make it more intriguing - you have to stand out from the crowd somehow. The best is yet to come. I've just finished printing lots of A4's (and cutting them in even more A5's) 'fill-out' forms for our stand visitors coming Thursday. That way I can track how many of the invited companies were intrigued enough to pay us a visit and how many new (and uninvited but very very welcome) contacts dropped by. I've already created two different templates in Mamut for the follow up on Friday: one for invited and visiting contacts and one for invited but not visiting contacts. All I have to do on Friday morning (after we 'rebuild' our showroom!) is add the appropriate tag (visited - not visited) to the contact details and just let the printer do its work (twice - sure you've figure that one out for yourselves). The Mamut software package also helps us the keep in 'constant' contact with our existing customers and by doing so (Happy Reminders) we are able to generate 'return' sales (customers do move home sometimes and want another Wood You Like floor in their new house) or maintenance contracts. All realised with a few simple clicks (and proper templates) once a week and once a month to remind them (at least every 6 months) of our existence. But there is another software program I will start using after the dust of the exhibition is settled (Mamut is very versatile, but not everything I want to establish marketing wise can be done with it). I will turn myself into a 'job-seeker' (probably miss-using the Jibber Jobber online program for that, but don't think Jason Alba will mind) and will enter details of all visiting ADDS in the program, creating a wish-list of jobs (orders) that I can access everywhere, plus see which company has network possibilities for me and other network contacts. Preparations for the exhibition (marketing materials etc) started roughly three months ago (I am a Capricorn, like to be 'prepared - sometimes into the extreme) during the monthly lunch-meeting with our business consultant and good friend Richard of Burns-Waring. Now Richard had been urging me for months to write a special booklet on our specialised flooring ranges but I had always placed that on the back-burner (double Dutch English fears etc). No escape this time. With help from Printing.Com Danny we selected a square 12 page booklet (we are not an ordinary wooden flooring shop, so our booklet shouldn't be ordinary - thank you, Richard) and I had to set myself a deadline to have text and pictures ready end of March. Danny made life very easy when I finally emailed him my efforts (PDF-file with white background was transferred into our creamy colour background, pictures checked on sharpness and everything re-sized from A4 to square, all in no time at all) and since this morning we are the proud owners of 1000 wonderful and (also according to another BNI-member) professional 12 page square booklets. Another new marketing 'prop' for the exhibition was suggested by BNI-member Medash Signs: a 'roller-banner'. Imagine a light weighted aluminium casing which 'pops-up' into a 2 meter high, bold coloured banner with company name and large pictures (so sharp!) making us 'stand-out (over) - the-crowd. Banner arrived last week and it is a jewel! (I promise to make pictures of it all next week). Last Friday I'd planned our monthly lunch-meeting again to discuss the last issues for the exhibition: how to make sure enough visitors would be willing to leave their details for further follow-up? The 'standard' business card box (and win a bottle of wine in our draw if you drop your card in) came to mind. Not good enough in the eyes of dear friend Richard: be bold, think big and become big. 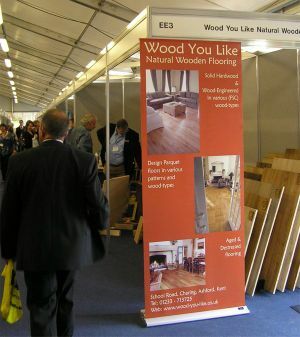 It became even bolder: what is Wood You Like promoting during the exhibition? Well, us of course, with our quality products from our quality manufacturers. So.....? this weekend I'd sent out a bold friendly request to our manufacturers to help us with this promotion. What kind of reply you think came back Monday afternoon? Further to the OneDayBlogSilence post of yesterday I've been thinking about my feelings towards this. Out of respect to all young lives lost at Virginia Tech I will silence my blogs on 30 April. But I don't want to have another OneDayBlogSilence a year after that, or a month after that, or a week after that. I fear a day of silenced blogs won't prevent the next atrocity from happening. Don't take me wrong on this, in Europe it has been received as a shock also: 33 young people dead through one despicable human act. Yes, it is mourning and sadness we feel for all those involved, especially the parents of the young students who have died. But I feel rage, not silence. Rage against guns. They should be silenced once and for all and the more we all rage about that the earlier they will be banned. I'll honour the OneDayBlogsilence on 30 April. I still rather silence all guns. My friends (web-wizards) over at WorldWide Creative (South Africa) posted an intriguing title on their blog: "The Heavy Chef" (never trust a skinny chef): What is an Accelerator Project? The first thing that came to my mind was (knowing they recently added some additions to their team): dumping a new employee straight into a new project on their own to see how quickly things would turn-around - or more likely up-side-down, imagine new employee running as fast as possible out of the door, screaming his/her head off out of frustration and promising him/herself never to set one step into the office there. "We came up with the term as a way of describing the projects we start in-house at World Wide Creative. An example of one of these projects is The Bug Zapper, an e-commerce site selling a mosquito and fly killer. We did it partly for fun, and partly to test out the tools that we sell to our clients. 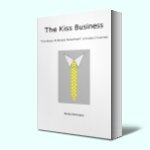 It is in-house project using our tools (website development and web marketing) to create a new profitable business." The post ends with a lists of benefits the Accelerator Project has, not only for the work-methods and clients, but also for the team and especially new team-members. Isn't it just great to receive confirmation of your business concept and business aim twice in one day? Like a stamp of approval? "However, this is only true if the wooden floor is properly maintained and protected. In general there are two aspects to be considered regarding the maintenance of wooden flooring: products and labour." And how easy is it to educate your customer in the need to keep his/her investment healthy, clean and beautiful with proper maintenance? Simple in our opinion: we tell them at the moment the floor is installed, we tell them four weeks after the floor is installed and every 6 months after that. Since the customer has entrusted us with the supply and installation of the wooden floor, they will trust us (and our maintenance products and maintenance service) with the after care. This is a business concept we have implemented 3 years ago, our customers come back to us time after time for the maintenance products (or ask us to carry out the maintenance for them - talk about the benefit of easy maintenance) and because we keep reminding them every 6 months we keep 'branding' us as a caring company, 'worthwhile' to send your friends, neighbours to for their own floor. "Someone told me you are the National Hot-line for wooden flooring problems?" and went on explaining how he received two different quotes with opposite advise on how to 'restore' his existing floor boards (one said: yes possible, the other said: absolutely impossible). Could I please set his mind at rest: who was right? I could, after asking for more details of the 'problem', and then had to disappoint him be telling him we couldn't carry out the work ourselves (400 mile north of where we operate). On Saturday I managed to create an index page for our Wood You Like FAQ blog (the blog that always must come first to me in any upgrades, updates or new features - it's where we 'meet' and talk to our customers). Remember my post Managing your business, managing blogs and time to manage lists? (30 March - ouch, time flies)? "Sure, there were the archives, and the individual categories and the search box, but I didn’t consider any of those to be handy. So I created a manual index page." Way to go, Scorpia and I hope you don't mind I've stolen your excellent idea. At the moment it's only for our FAQ Natural Wooden Flooring Blog, but it is a start.